Clear Turn Signal lenses for 2007+ R55 R56 R57 R58 R59 MINI Cooper and Cooper S. These clear lenses go in the side scuttles on the fender of your MINI. If you have a Cooper non S or did not order the clear lens package you have an ugly amber lens in the scuttle. These clear lenses are simple direct factory replacements for the stock lens and add some style and good looks on the cheap. These are 50 state legal too. 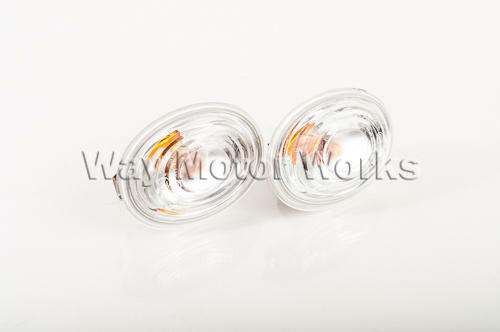 Sold as 2 clear lens turn signals that include amber bulbs, and both bulb sockets.